In the 4th book of the series Jennifer Joy will focus on Mr. Tanner’s acceptance of who he is, where he stands in life and what role his family will have, but also on his relationship with Arabella Annesley. This original character is just as proud and honorable as Mr. Darcy but he has some insecurities which make him more fragile and more lovable as a character. 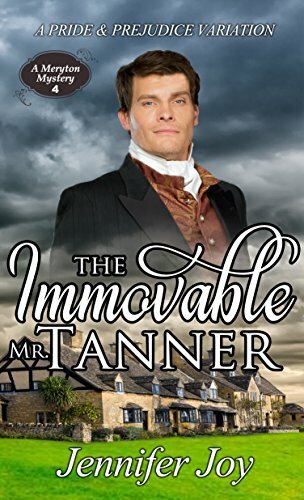 Behind his strong exterior lies a man who doubts his own worth and this particular feature made him more believable and lovable because even if Darcy is the perfect hero, Mr. Tanner brought more to this book as a character than Mr. Darcy usually brings. Mr. Tanner shows us that the circumstances of our birth do not define us and that we may become whom we want to be. It is our personality, our strength and our values that make us who we are, and Mr. Tanner is proof of that. Of course this book will also have a mystery that needs to be solved, it is part of the Meryton mysteries series after all, but even this is closely related to these two characters and it also brings to light more information about Georgiana’s companion. We had seen Mrs. Annesley in the previous books, but on this one we will get to know her life story and I believe none of you would have guessed everything she went through! She is not a boring old widow, I tell you that! Even if you prefer stories centered in Darcy and Elizabeth, I recommend this book because I’m sure you will soon forget about them and focus all your attention on Mr. Tanner and Mrs. Annesley, their love story is beautiful and these characters will drag you into the book. You will also enjoy seeing how Darcy and Elizabeth’s married life is. This book is both a sequel and a secondary character novel, so I’m sure it will appeal to all readers. Oh Rita! How could you think I would forget about Darcy and Elizabeth??? I really liked Tanner and his lady love. They had their problems to solve but then who doesn’t? I must admit theirs were a little more difficult. I agree with your lovely review. You remind me. I really need to start this series. I’ve been in a mystery mood lately, too. I love that her Mr. Tanner is as engaging as even Mr. Darcy. I loved Tanner so much! Thanks for sharing your thoughts, Rita! Thank you for your review, Rita! What a lovely surprise! I’m thrilled you loved Tanner. He brought out some of Darcy’s tender qualities, and I can hardly wait to continue the series with Georgiana’s story. Great review! I loved Mr. Tanner and the story Jennifer wrote! I also have read and enjoyed this series by Jennifer Joy. I have also read others by her. I have all the books in this series but this one and it is on my wish-list. I’ll have to replenish my book fund so I can grab it. I’ve been distracted lately and this review post has renewed my interest in the series. Thanks to Rita for hosting with her review and blessings to our author Jennifer Joy on her work.